Welcome back HotRodRegal.com fans! I would like to introduce both my New Shop and the New El Camino. We have a New shop!!! We have a New El Camino!!! If you can’t tell, I am very excited about these industrial works of art. Like all of our fun projects, these are always in-work, never truly finished, and always being upgraded to keep the cool factor high. I will do my best to keep you informed on all the upgrades and future changes. 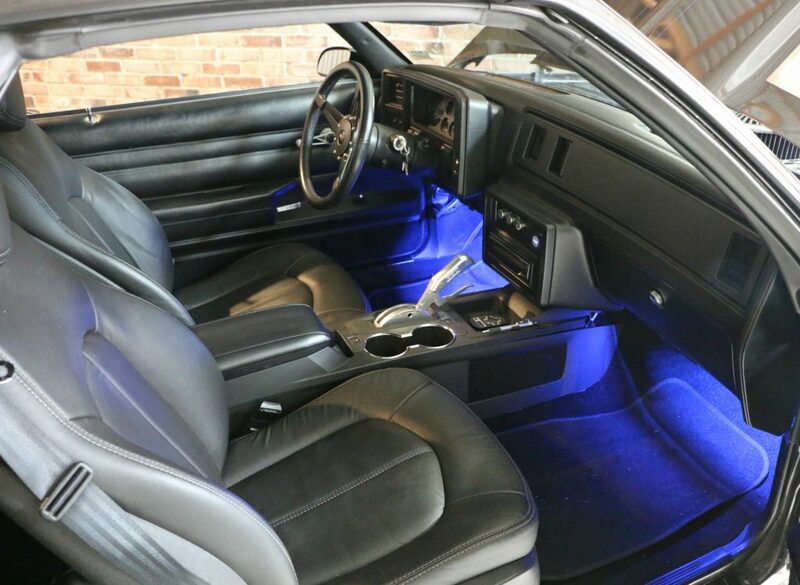 There are a lot of great people to thank for these aftermarket parts that you may notice on the new El Camino. I will be showing how Greg made them work together in future coverage, so you can take these ideas and make them your own. 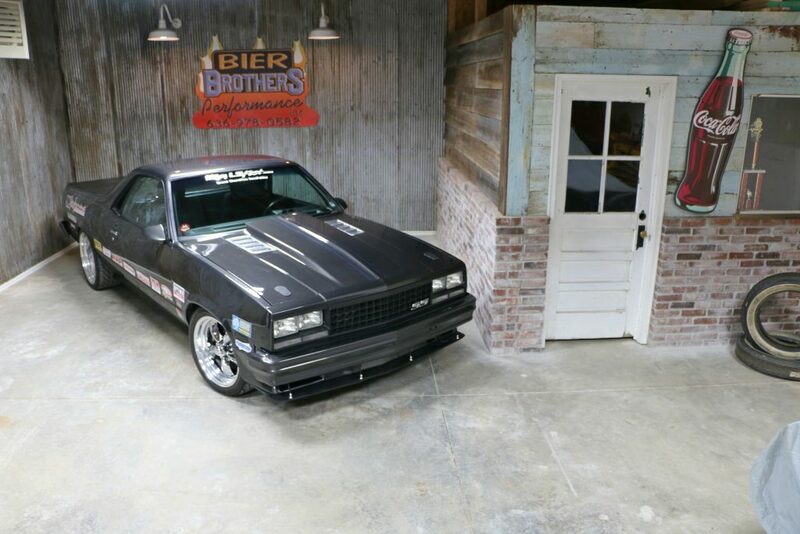 I hope you enjoy the engineering my friend Greg Cragg has put into “The Race Car” El Camino shown here in this introduction article. Similarly, I hope you enjoy seeing these fun projects displayed in my new Route 66 style “Old speed shop”. Welcome to the new shop! The Hot Rod Regal Speed Shop. Going forward, you will see many products and projects showcased at this location. My take here was a Route 66 style, “Old speed shop”. No speed shop would be complete without an old speed shop sign! We got a hold of the now closed, Bier Brothers speed shop sign, and asked owner Kenny Bier if we could use it in the shop. He was happy that it was going to someone that would appreciate it and use it. (Bier Brothers was a St. Louis/St. Charles landmark as seen from I-70 for many years). Bier Brothers lives on with us! I would first like to thank you for being patient with me as I have not published an article for some time. The new, or rather old speed shop is mostly why I have been remiss on the article publication. The Hot Rod Regal Speed Shop was COMPLETELY built by myself and my friend Greg Cragg and has consumed a large portion of our time. We are not totally finished with it however, and you may even see future articles on how we are setting up different sections of the shop. For example, check out our shop lights we used at www.superbrightleds.com. If you can’t see, then you can’t work. Seeing the Hot Rod Regal Speed Shop for the first time here, you may have a few questions about it. For instance, how did we come up with this idea? We found this property with some TLC needed, so we set out to fix it up. I knew this shop was going to be cool the first time I saw it, but it has evolved like all projects do. I have always wanted to build a Route 66 Gas Station like you see in some of the more over the top car collections and museums, but with the price of most Petroliana and the logic of our builds, a Speed Shop was the way to go. Plus, how many gas stations do you see vs speed shops? We think a little different here at HotRodRegal and I believe the Speed Shop stands out. We had the idea worked out, so the next step was to acquire the pieces of the puzzle. Where in the world did we get all of the material for this creation? The Hot Rod Regal Speed Shop, is made from barn wood. Yup, that’s it very old barn wood. Barn wood is all the craze right now and if you have been watching any social media, or any major media for that matter, barn wood is pretty hard to get, and the good stuff even harder. Lucky for us here in the mid-west, old barns can easily be found and usually obtained with some sweet talking to a forward thinking farmer/landowner. This specific Barn was built in 1870, in Moline, Illinois; and moved to Missouri in 1955. As with many of these old barns, the beams were hand hewn, the siding was very weathered and aged (to the point of being petrified), and the old tin had the perfect patina. 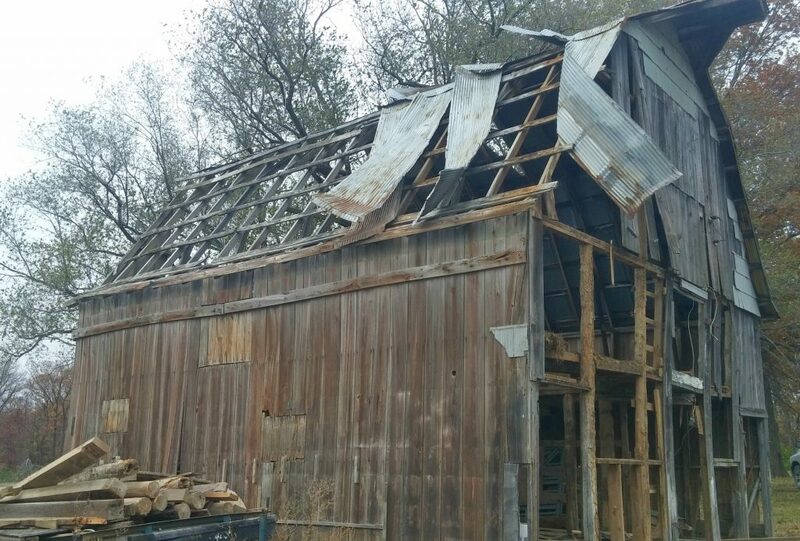 The barn had damage and the land owner wanted it removed. Transforming the barn into a speed shop has been a blast! This is the last photo of the old barn, and we wanted to pay tribute to the guys that worked hard to build it (Americana history right here). They just don’t build them like this anymore. So, what’s next for the Hot Rod Regal Speed Shop? I plan on sprucing up the floor a bit, adding some more electrical, and furnishing it with the proper hot rod building supplies/tools. Do you have any thoughts or ideas for the shop? Please connect up with me on Instagram, Facebook, Pinterest, or Youtube with the links on the home page. Now, how about “The Race Car” El Camino my friend Greg Cragg has built. I gotta say Guys & Gals, this one is cool! I love the engineering we poured into it. This is the kind of build that everyone can enjoy. Low budget builder to high end racer – we think there is something here for you. Drive it to the event, run the race, park it at the local restaurant, drive it home and have some fun with other like minded drivers on the way home. Greg drives this one everywhere! Yes, that is a gravel road… No trailer queen. 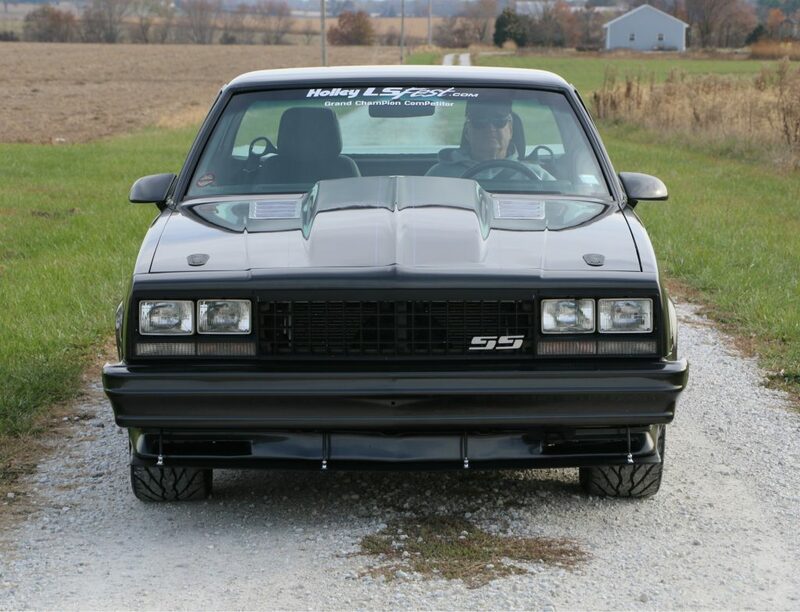 The very first time The Race Car El Camino was on the street, it was driven from St. Louis, MO to Bowling Green, KY for HolleyFest2017. There was no testing, no trial runs, no maiden voyages, no adjustments made! 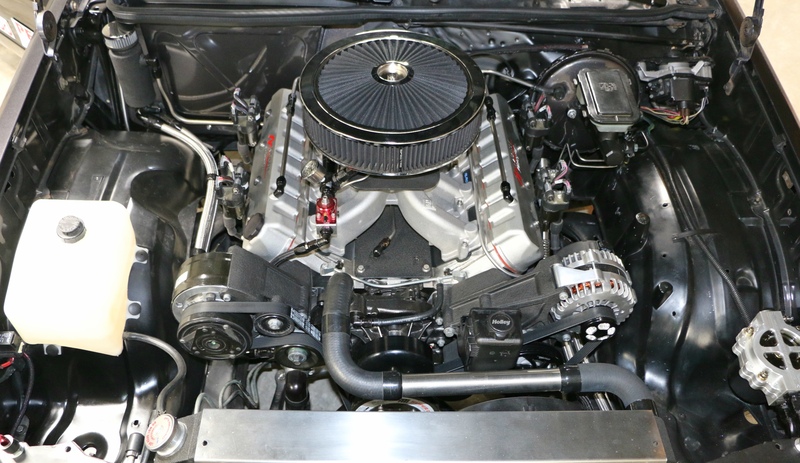 The TCI transmission was buttoned up the night before, and it was lowered down on the ground the morning of HolleyFest2017. The Wilwood brakes were adjusted and bedded on the way to HolleyFest2017. We drove it all the way loaded down with luggage, unpacked at the NCM motorsports park, auto crossed it, parked it at the Hotel over night, raced it again the next day, and finally drove it home to St. Louis. Not even so much as a hiccup! We were amazed. The Mast Motorsports stroker engine is at the heart of this beast (not a single drop of oil in the catch can after all of that either). The TCI street fighter /auto cross 700R4 transmission we got 2 days prior to HolleyFest 2017 was a real champion too. Every part we fit into this car was well mannered, and proved to us that the aftermarket parts we chose were worth it! 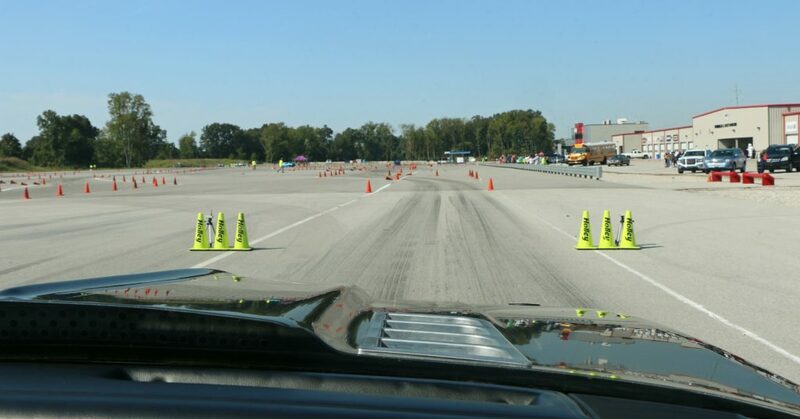 This is the National Corvette Museum Motorsports Park at HolleyFest2017 from the passenger seat. I can’t believe we drove that whole morning, unloaded, and rolled up to the starting line like we were there all day. This is what I would call “No prep racing”! Yeah that was FUN! Did you see Greg at HolleyFest2017? Well, now you know part of the story behind this cool Camino. 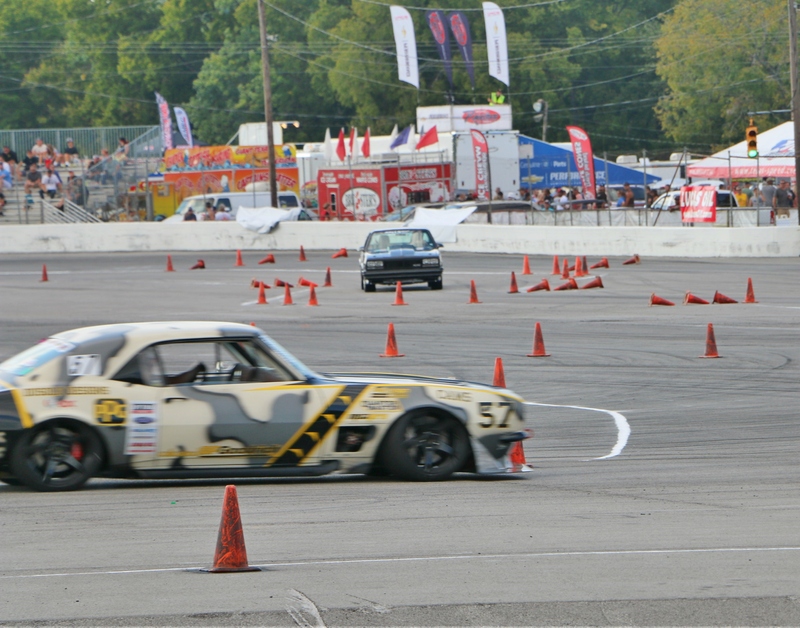 Not only did we have ZERO seat time in it, but we had to drive it home 5 hours after thrashing on an untested vehicle… Maybe not the fastest times on the course, but we did it! I would say this experience is a true testament of quality about the aftermarket parts that make up The Race Car El Camino. Greg Cragg competed with a very high profile group of cars, with a completely UNTESTED car. 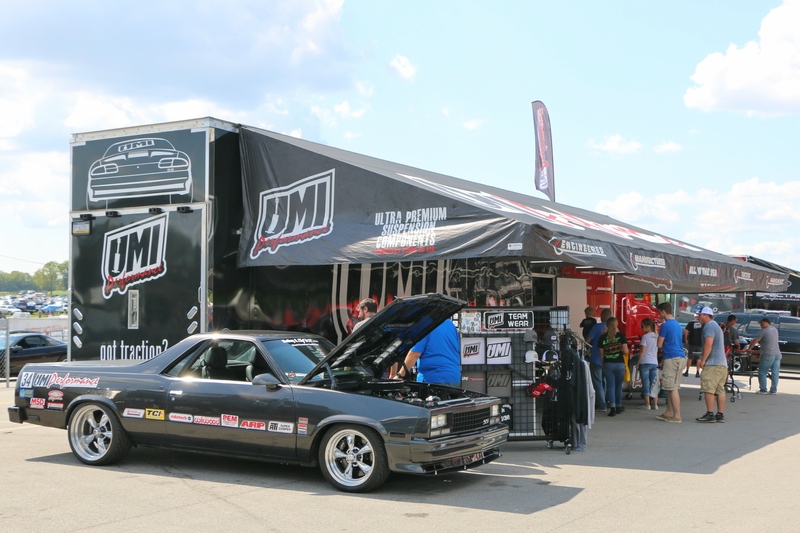 When we were not out running the car in the events, we were invited to park at the UMI Performance booth. Why? well because The Race Car El Camino is loaded up with UMI Performance goodies (more details on those parts in the future). Its always fun to make friends. Especially when they have some of the coolest and most advanced G-body parts on the market! Thanks for the parking space UMI Performance! The fun didn’t stop there this summer. We thought we would try some test and tune closer to home at Gateway Motorsports park near downtown St.Louis. Lessons learned: 1. Need better tires. 2. Times & numbers obtained – performance goals to work towards. We also learned this combo of engine, transmission, drive train, and suspension is very reliable and down right fun! Another successful event. 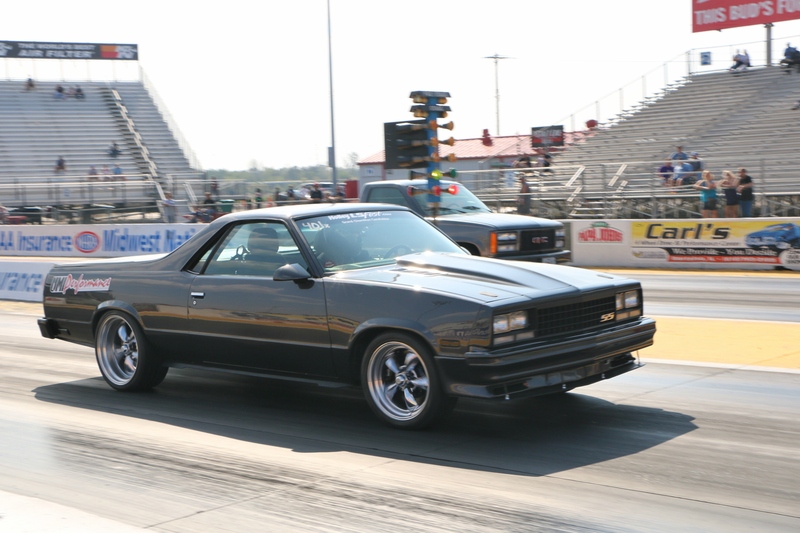 The Super Chevy Show at Gateway Motorsports park in St.Louis was a great test and tune event since it’s close to home. So as you can see, we have been very busy this year with many projects that I have not written about. So much fun figuring out the issues of combining parts, coming up with ideas for The Race Car El Camino, Learning from Greg and his knowledge of Drag Racing from the 1960’s, and constructing the Hot Rod Regal Speed Shop. This is a fun place to make speed parts come alive. There are some things we will be adding here, but for now, its up and running. 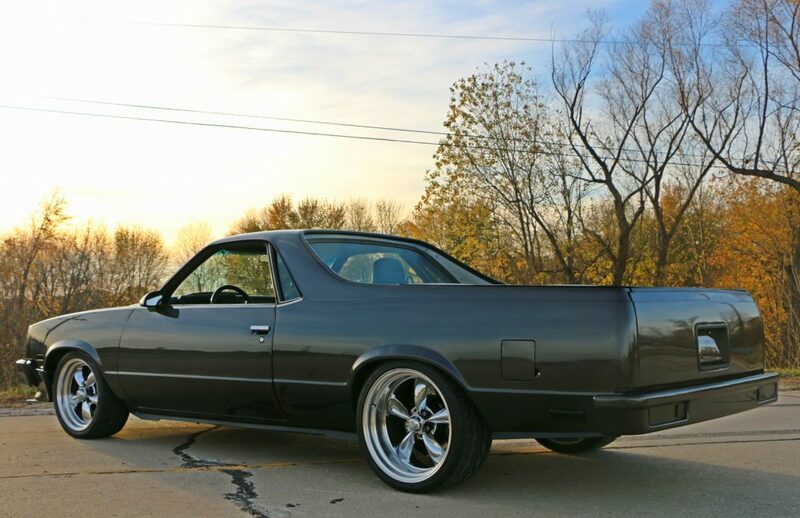 The Race Car El Camino has no problems cruising in the city or having fun on country roads. Thanks to everybody that helped us enjoy these country roads! Lets not forget about some of the inside quality work too. Check out Gregs interior! Dakota digital dash, B&M shifter, Vintage Air, CTS Seats, custom consol = too cool for school! Pretty sure The Race Car El Camino doesn’t know it’s not a Caddillac. 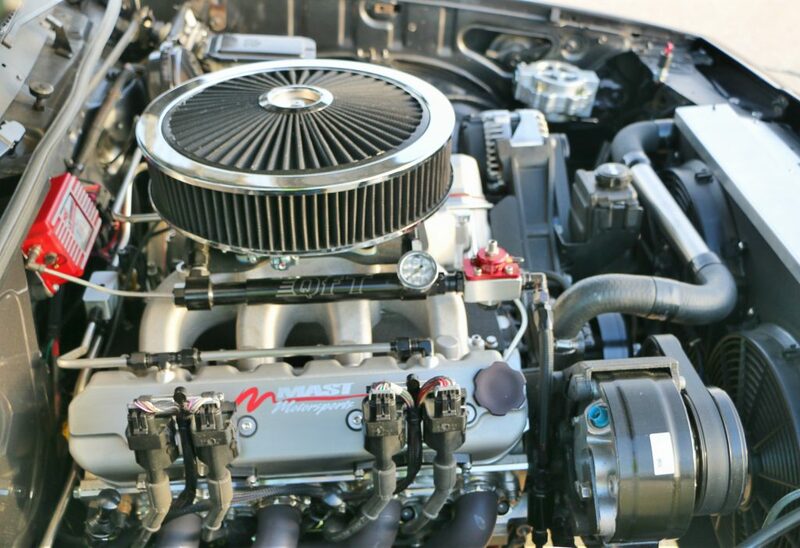 I have mentioned that The Race Car El Camino has a MastMotorsports stroker engine. If you follow my Social media accounts, then I am certain you have seen some glimpses of the monster under the hood. It is the MastMotorsports 416ci stroker, and it’s one nasty little small block that thinks it’s a big block. Please don’t tell it any different. I will have a complete build article and dyno test on this awesome dinosaur eating air pump. 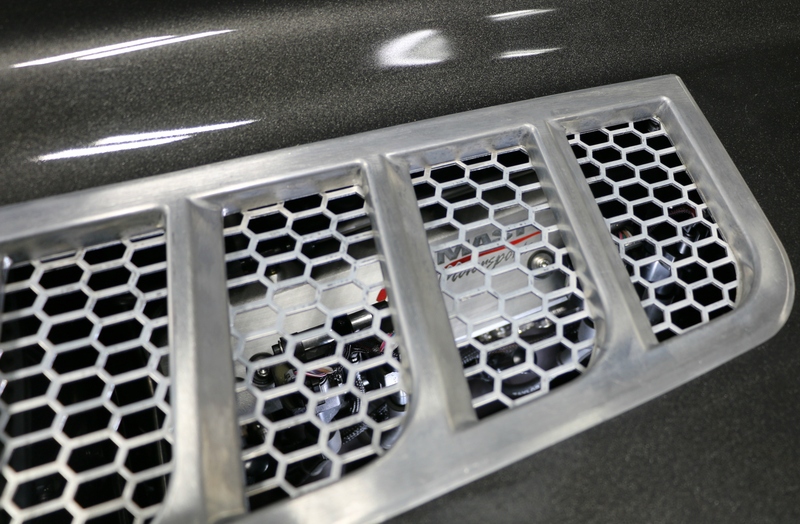 These VERY functional Camaro 5 hood vents from Hexvents.com give onlookers a subtle, but fair warning what lurks beneath. Mast Motorsports, Spectre Performance, Ultimate Headers, Power Master, Holley, MSD, ClearviewFiltration, QuickFuel Technologies, CoolCarb, SO MANY COOL PARTS! Just so you don’t get the wrong impression of Greg’s latest creation and our overall attitude towards building. We do love to thrash on things, but that’s not to say we don’t take care of things either. The Race Car El Camino does drive down a gravel road on occasion, but its for good reason. The Race Car El Camino can hold her own when its time to shine too. I have a very sweet little photo op place near the shop. There is a closed section of Hi-way with a condemned bridge and no one living near by to bother us for when we like to shine up our cars for photos. I am an “Engine Guy” so I can never just look at a car without examining its heart and soul. Thus meaning more Engine pics! Lastly, not only do we have a cool photo op place, but we have our own little slice of drag racing heaven! This same photo op is connected to a 1/4 mile paved straight away! I can not promise that you will see many images of this test and tune area, but trust me when I say its fun to have around. Check out this perspective! 1/4 mile with no turn offs, no traffic other than an occasional train. I can not think of a better way to end this article! 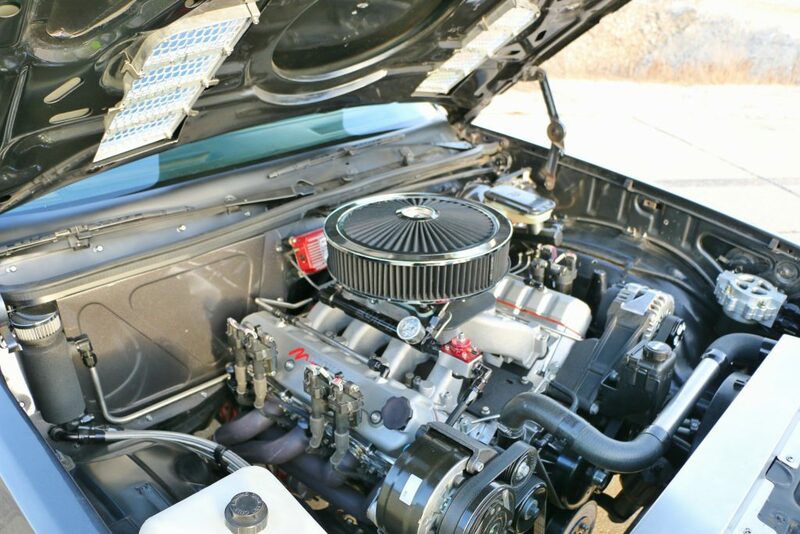 Well hopefully I am leaving you wanting more… Because there is more… We have all the individual projects documented it took to get The Race Car El Camino up and running. You can expect some details in the future. Hey what happened to the Hot Rod Regal? No worries, she is still around and I am currently in a “battery box relocation/build” Priority required the Hot Rod Regal Speed Shop to be finished first. So yes, there will be more info on that build also. As for the Red LSX El Camino, I think Greg is having more fun with The Race Car El Camino right now. So you will probably see more about it first, but I will still be covering it as things change. As always, Thanks for checking out www.HotRodRegal.com – more engineering in the near future!